At the age of 19, Jon received serious brain injuries in a car accident. During his recovery there was concern, that due to his behaviour, Jon might have to live in a secure unit. Jon has proven the medical experts wrong. Like every National Star student, Jon had an individualised programme when he came to National Star in 2010. For Jon, the joined–up approach of education, therapy and care was crucial to his development. 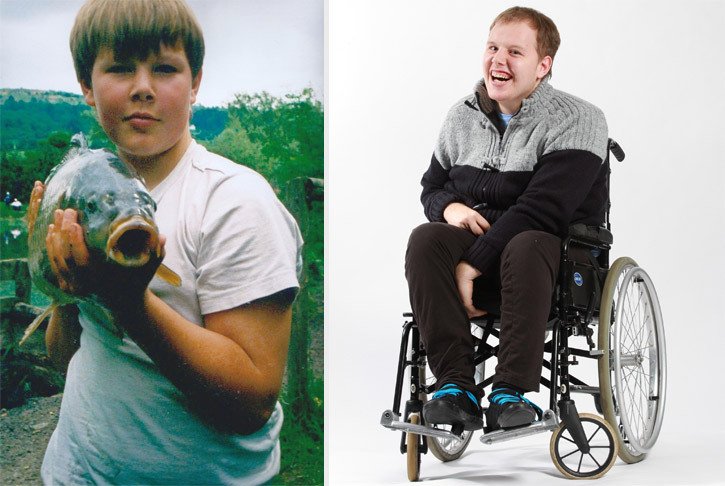 Through hydrotherapy, physiotherapy and occupational therapy, Jon built up his strength and mobility so that he was able to do standing transfers. His literacy skills were embedded in all of his practical sessions, such as life skills and cooking, where he was encouraged to look at images, signs and symbols in order to contribute to conversations on a given topic. Jon now lives in Foundation House, National Star’s long–term accommodation in Gloucester. Living as part of a group of other young adults with differing care and support needs, he enjoys being amongst his peers and taking part in a range of activities, from going to the pub to abseiling. He makes and communicates his own choices about what he wants to do. Consistency is important for Jon. Foundation House has allowed him to remain near his friends and family and to be able to access therapies and key workers he knows at National Star.